Four books into the series, I was no stranger to the prolonged moments of slowness and inaction that periodically crop up in My Struggle. 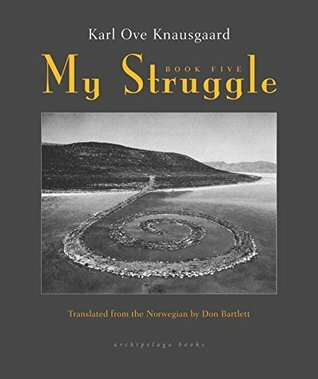 It’s to be expected from a project that aims to document seemingly all of a person’s life, and one of Knausgaard’s great accomplishments is keeping readers engaged and clamoring for more, even when the narrative drags. Book Five is no exception, though I did find it more trying than the previous installments. Here we trace twenty-something Karl Ove’s attempts at forging a writing life, which, for the first 500 pages or so, is mostly made up of bouts of acute self-consciousness that end in drunken escapades. Racked with guilt after each binge, our hero refuses even the slightest efforts at remedying the situation. It’s this recursiveness that makes Book Five a bit of a slog and, for me, induces a surplus of annoyance. The final 150 pages, which detail Karl Ove’s first marriage and return us to the death of his father, are more than worth the price of admission. We know all too well what happens to his dad, as this is the core subject of Book One. By now, though, we have gained a completely different perspective, one deepened and colored by the thousands of pages in the books that follow. Being brought back to where we began is a lot like cresting a hill to glimpse down on a city or town you know and love but have been away from for a long time. You approach it with an utterly different understanding. It’s a moving, powerful experience.